A federal appeals court has ruled that the NSA's bulk phone data collection program is illegal. This ruling apparently has more teeth than an earlier, similar ruling and reportedly forces Congress to decide to either end or replace the program. This is a "libertarian" event. So we're looking for Pallas connections to herself, Mercury, the Sun, and/or the North Node in the accompanying astrology. 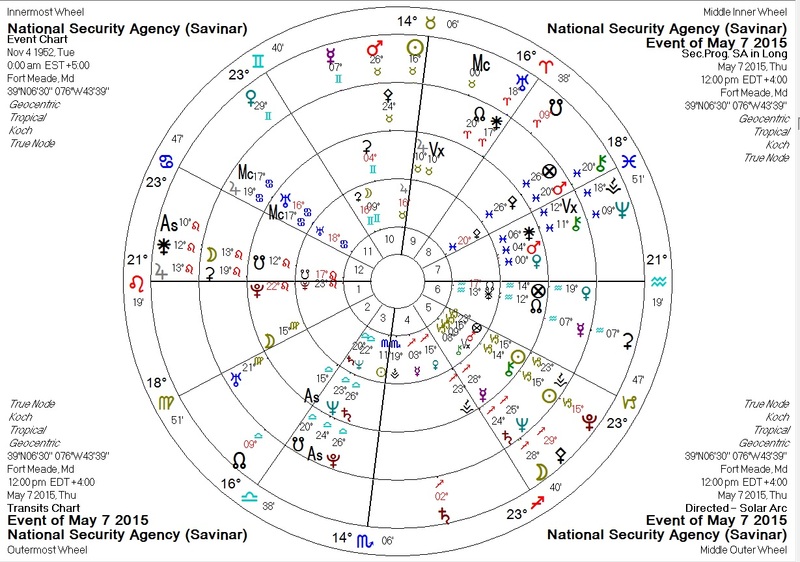 Astrological weather against the Matt Savinar NSA chart is somewhat more interesting this time than against the authorization chart I've written about in the past. So we use Matt's chart here. Transiting Pluto conjunct progressed Sun: a type of death? Transiting Uranus trine NSA South Node: unexpected loss. Transiting Chiron conjunct NSA Pallas: injury/adjustment to NSA ethics. Transiting Chiron conjunct solar arc Mars in Pisces: injury/adjustment to secret activities. Transiting Saturn conjunct NSA Mercury: communications, clamped down. 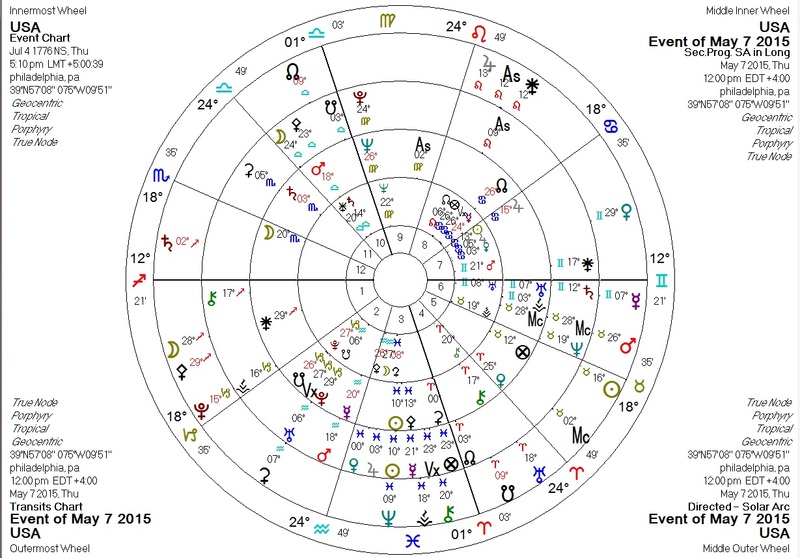 Transiting Jupiter conjunct NSA South Node and solar arc Moon (ruler of the 12th House): publicity on hidden matters. Transiting Jupiter square NSA Sun: publicity, from an inconvenient angle. Transiting Pallas square progressed Pallas and quincunx solar arc Pallas: ethics. Transiting Mars conjunct solar arc Pallas: ethics, acted upon. Transiting Mars square NSA Pluto: the NSA's power under attack. Transiting Sun conjunct NSA Jupiter, co-ruler of Pallas: publicity and ethics, again. Here's the same event for the US Sibley chart. Transiting Pluto opposite US Sun and progressed Jupiter: a drastic change in the goverment and/or public policy? Transiting Neptune conjunct progressed Sun in the Third House: "squirreliness" around communications. Solar arc Uranus conjunct US South Node in Aquarius: a change in "hidden technologies"? Transiting Jupiter quincunx progressed Pallas: publicity + ethics. Transiting Pallas sextile US Pallas, weakly quintile progressed Pallas: ethics/libertarianism strong. Transiting Mars square US Pallas: action on ethics. Transiting Sun quintile progressed Pallas; transiting Mercury square progressed Pallas; transiting North Node quincunx progressed Pallas: these are all weak, but together suggest a bit of a libertarian "win". Transiting Mercury conjunct US Uranus in Gemini: news about communications/technology. Have we truly escaped Uncle Sam's all-seeing eye? I suspect not. But it's nice to give it a good poking from time to time.